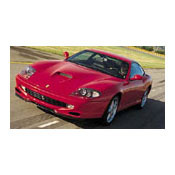 (1996 - 2001) The Ferrari 550 Maranello and 550 Barchetta were 2-seat Gran Turismo sports cars built by Ferrari. The 550 is powered by a 5.5-liter, 478 hp DOHC V-12. Partner that with your choice of a 5-speed automatic or a 6-speed manual transmission. ABS comes standard. Great sounding engine from 4,000 rpm upwards, linear acceleration, low down torque, "look at me" factor, bootspace (my last couple of cars were Porsche's, which were a lot less practical - I use the car as a daily driver), supportive seats, comfort - a true GT. Teaches you to drive smoothly (through necessity - see below). That gearchange (it's a manual). TDF Blue/Tan colour combination looks great. The only car I've ever owned that forces me to turn the stereo off just to listen to the engine noise/exhaust note. My god, is the traction control really on? Are you sure??! Having come from a 4WD 996 Turbo where I got used to being able to give it a bootful of throttle in any gear and any weather conditions thanks to the incredible traction, the 550 spins its wheels in 1st, 2nd, 3rd, 4th and (once!) 5th gear if you give it anything more than 2/3rds throttle - the upside of this is that it does teach you to feed the throttle in smoothly rather than just stamping on it. Am about to change my Michelin Pilot Sport tires for the Pirelli P Zero Rossos like I used to have on the Turbo. Hopefully the traction will then improve. Squeaky brakes if you just drive it around town (I live in London, so this is a pretty regular drive for me - does ruin the experience a little if you're looking great and just when you pull up to the lights, the car sounds like a broken london taxi thanks to the squeaks!). Rear view could be better. Is there any car that you can buy that has a worse mpg figure?? Still, I guess if its got 12 cylinders, they're going to take a bit of feeding... Could do with a small digital speedo gauge at the bottom of the analogue speed dial, like Porsche. I know I'm over the speed limit, but by how much?! Headlights could be stronger. Handling is pretty heavy - whereas the Turbo drove like a go-kart, this drives more like a power-boat. Small turning circle. The world's most bizarre handbrake - whilst having it between my seat and my door makes the middle of the car look a lot less cluttered, it's not the easiest to use! The exhaust note is a bit muted. The Tubi exhaust system is needed. Police are always very interested in such a car. Insurance is hefty price, but of course this is a Ferrari. The Ferrari 550 is quite possibly the greatest modern front engine Ferrari ever made. The 5.5 liter making 485 horsepower is an incredible powerplant. This car will run 4.5's to 60mph and 4.2's if your good. competition for the 550 are; the Porsche 911 Turbo, Lamborghin Diablo 6.0, Aston Martin DB7 Vantage and the NASA space shuttle. This car is amazing. I am 17 and I got the chance to drive this machine and i nearly puked with excitement when i got in the cockpit and sat down in the driver's seat. I was so nervous because I didn't want to wreck it! Of course, you can expect outrageous acceleration from Ferrari, but the thing I was most impressed with was the handling. I drive a WRX and I was blown away. The wheel feels so crisp and precise in your hands. I drove it on the streets of southern France, so I wasn't really able to open it up, but i was able to test the acceleration. Again, amazing car with expected quickness and diabolical handling. You feel every one of the 400+ bhp that is produced by the V12 power plant. The seats are supportive, and the interior is race orientated, yet simple and functional. The pedals cannot be adjusted for driving position, and the engine is far from economical. Be prepared to pay some hefty fuel bills! What a fantastic machine. Ferrari has once again released a wonder. On the gas, the ferrari V12 just bursts with power. One hundred and fifty clicks comes around in no time at all. The car has a reassuring solidity, and its suspension guides it effortlessly through the tightest of corners. No other brand of car has quite captured the imagination, as ferrari. 1999 Nissan 200SX, 2001 BMW M3. Excellent car! Great power! Incredible fun factor. Best grand touring car on the road. gobs of power- speed to burn- stable- can't tell the difference between 80 and 125. Good brakes. Great high speed tourer with a good sized gas tank- LA to SFO on 2 tanks. Seat is hard and needs more lumbar support and gas pedal is not adjustable for position. You have to think about where you are going to park it when you get to your destination. Sold the Daytona as soon as I drove the 550. More of everything and very little to complain about. The biggest conplaint is that I can't go anywhere without drawing a crowd- and with good reason! It is a looker- Need a "pick-me-up"? apply more right foot. It seems that it will run for ever. It is a bit heavy in the corners compared to some(not the Daytona)but very dependable and lots of advance notice before it breaks loose- then apply more power and you are on your way. test drove this. You know what for the money, go out and pick up a Z8. More reliable. What are you buying the car for? To look cool or to kick some serious you know what. Love the car drinks gas but dont care buy one lots of power cant help but burnout. This car is simply awesome but i don''t think it is worth the price. Then again no car that sells for this amount is really "worth it". Excellent collector piece though.